Aside from the ground-breaking $370,000 LFA sports car, Lexus design has been stagnating. The entire line of luxury sedans look more ponderous than svelte, with baroque styling cues that seem Germanic rather than Japanese. 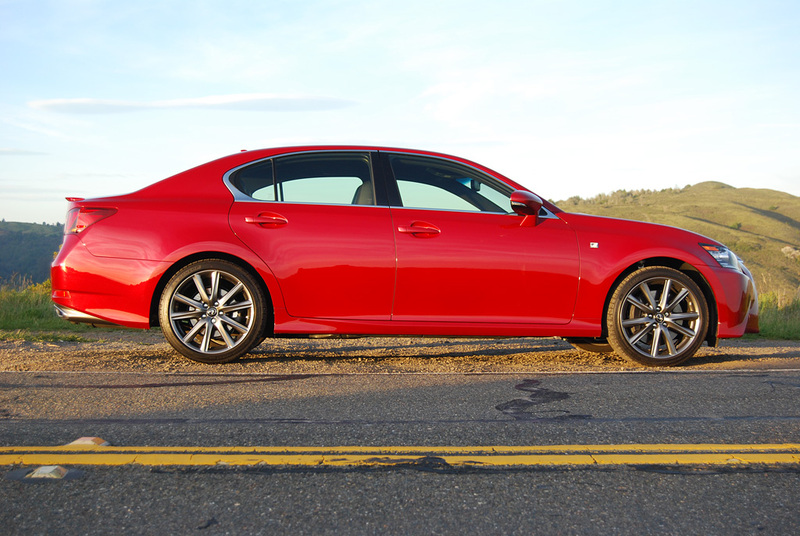 Visual boredom has been the hallmark of the mid-level luxury sedan designated GS, a high-hipped Lexus remarkably devoid of personality. Until now, that is. Its replacement, the all new 2013 GS, will debut in February, 2012 as a 2013 model. The company has reconceived this product from the ground up. The end result is a startling transformation of the GS that will delight art aesthetes and performance addicts alike. To redefine the Grand Touring Sedan, Lexus sent one team of designers around the globe, from Russia to South America, China to the Middle East. The result of that research is the new GS, a startlingly fresh design that marks a decided departure from any sedan the company has built before. Unlike previous timid redesign efforts, the GS adopts a new stylistic vocabulary. Says Brian Smith, Lexus VP of Marketing, “With this car, going forward, there is no going back. This is the new face of Lexus.” And a handsome face it is. Instead of a benign grin, the front of the GS seems to snarl rather than smile. Aerodynamic fluting is the key word here. Fluted radiator ducts divert enough air to cool the 3.5 liter V6 and cool the front brake rotors. The rest of the frontal airflow skims beneath the body where Lexus has installed 8 fins in the underside panels to expedite air flow. Even the tail lights are fluted toward this goal. With its truncated frontal and rear overhangs, and muscular fender flares, the GS looks imposing. The bold appearance is justified by the mechanical underpinnings. The GS in all its forms (Base Model, AWD, Hybrid and F Sport) is a prime GT car, with enough horsepower, suspension sophistication, and interior comfort to handle any travel situation on any paved road with supreme aplomb. The new 2GR-FSE 3.5 liter V6 boasts direct port fuel injection which helps produce 306hp and 277 lb.-ft. of torque. 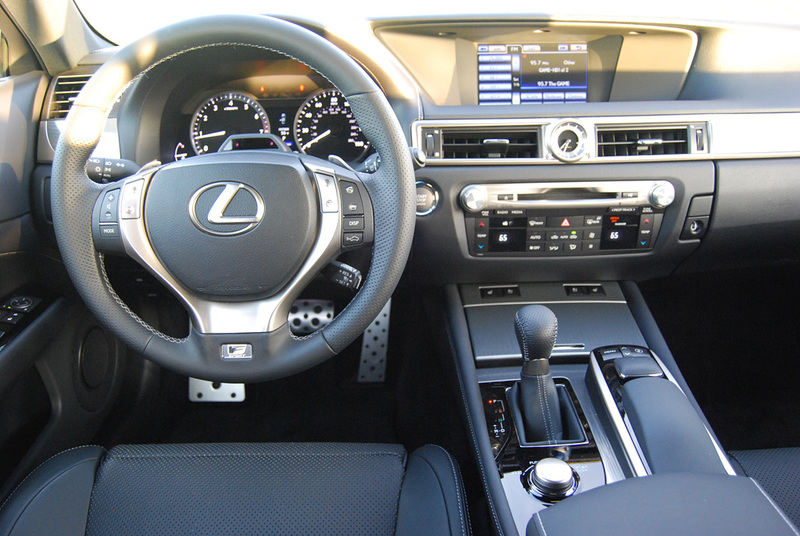 Lexus, which has heretofore believed engine silence to be golden, has changed aural direction on the GS. Fitted with an “Intake Sound Creator,” this V6 snarls like a trumpet when the throttle is cracked wide open. 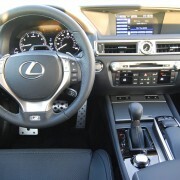 Paddle shifters can be used to operate the 6-speed automatic transmission manually. When in manual mode, upshifts occur .3 of a second faster than in automatic mode, downshifts 0.2 of a second quicker. An all-wheel-drive version (Base Price: $49,450) is available, with torque split ranging from 50/50 to 30/70 front to rear, depending on traction available. A Hybrid GS 450h, marked by distinctive LED headlights, will also offer more horsepower than the standard V6. The Hybrid’s 2GR-FXE engine produces 338hp and yields a combined fuel economy rating of 30 MPG. A Navigation System with a huge 12.3 inch display panel is available on all models. My favorite version of the new GS is the F-Sport model, which rivals the best European sedans for crisp handling and sheer grunt. The F-Sport rides on special 8 and 9 inch wide, 19” diameter rims bearing the largest tires yet seen on a Lexus: 265/35/19 Bridgestone RE 050A. 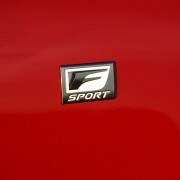 Higher spring rates, more athletic shock absorbers, and bigger anti sway bars make the F-Sport GS a car you could take to track events and run with confidence. A console mounted control knob allows you to adjust ride, steering, traction control and throttle sensitivity for Normal, Sport or Sport+ (i.e. track) work. The seats in the F-Sport are superb, 16-way adjustable, with compressible side bolsters to resist lateral movement. During a day long test on the road course at Las Vegas Speedway, the F-Sport GS took everything we could dish out without breaking a sweat. 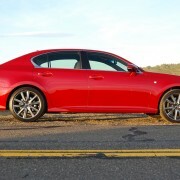 On the Sport+ setting, the flashy sedan lived up to its prepossessing looks, cornering flat, stopping short, and screaming from apex to apex like nothing Lexus has ever built before.